From healthy fats to fiber, aging bodies need certain foods to promote good health. 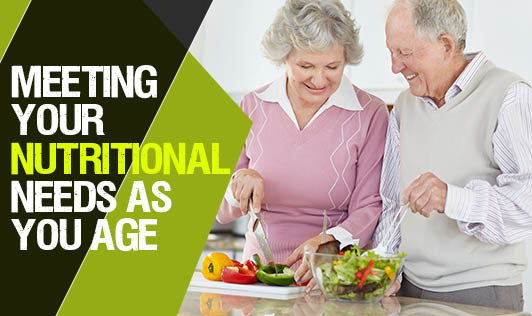 Get tips for eating well and adapting your diet as you get older.Our bodies change as we age. In turn, seniors have very different nutritional needs than teenagers, children, and even middle-aged adults. Your metabolism slows down. This happens naturally, but it becomes more pronounced if you don’t get as much exercise as you should. When your metabolism slows, your body doesn't burn as many calories, which means you need to eat less to stay at a healthy weight.As a result, the foods you eat should be as nutrient-rich as possible. Most women with average activity levels need about 1,800 calories per day. Men with an average activity level need about 2,300 calories each day. You’ll need fewer calories if you’re sedentary, more if you are very active. Your digestive system changes. Your body produces less of the fluids that it needs to process food in your digestive system when you get older. These changes can make it harder for your body to absorb important nutrients like folic acid and vitamins B6 and B12. Your appetite may change. Many seniors take one or more medications for health conditions; these can cause side effects such as a lack of appetite or stomach upset, which can lead to poor nutrition. Your emotional health may be affected. Seniors who feel depressed or lonely often lose interest in eating. On the other hand, emotional issues may cause some people to eat more and gain unwanted pounds. Now that you know what to do, you can make the necessary changes to your diet and a real commitment to your senior health. It's fine to start gradually: Exchanging junk foods for healthier options is a good first step. But try to make changes every day that will bring you closer to your goal of a healthy diet and a healthy life.